If I want to be a top earner in PR and still take a vacation I’m going to have to live in the Midwest and work in government PR. That’s according to the results of the first-ever PR Daily Salary and Job Satisfaction survey. The survey also found that more than half of PR respondents say they work more than 40 hours a week. Most received a raise last year. Despite the gains, most PR professionals are dissatisfied with their pay. More than half (52 percent) of respondents said they are somewhat dissatisfied or very dissatisfied with their compensation. More than 2,700 public relations professionals took part in the online survey, which was conducted in December 2012. “Everyone’s curious about what their peers in the industry earn, but they rarely ask,” said Mark Ragan, CEO of Ragan Communications and publisher of PR Daily in a press release. Forty-three percent of respondents have been in the PR field from five to 20 years; most respondents (77 percent) were women. Government PR professionals get the most vacation time: 42 percent get four weeks or more. Most respondents work at least 40 hours a week: 57 percent say they log 40 to 50 hours per week. Deskbound lunches are most common: 69 percent of respondents have lunch at their desks on most days. The Midwest is home to the most top earns in PR: 33 percent of those earning more than $25o,000 hail from this region. Most PR professionals (51 percent) make between $35,000 and $75,000. I wrote two press releases this past week and pushed back on one other saying it wasn’t newsworthy. When you do write a press release what should you include? Write a strong headline that lets the reporter know what the point of the release is. Don’t make it all about you or your organization. A reporter is looking for a story that will interest readers. Include the necessary facts and at least one quote. Don’t go overboard. If the reporter is interested, he or she will call to get more details or arrange for an interview. Carrie Schum, executive vice president of Porter Novelli, said press releases are most useful when written with simple, straightforward facts. The press release should be well written with good grammar and following AP style. Contact details also are critical. Who will be available to explain data in the release or track down additional information? Include that person’s name, number and email. That person will need to be available at most any hour since the news cycle is now 24/7. At the end of the release add a paragraph that tells what your company does and who it serves. This information is known as the boilerplate. Once the release is written be sure that you have a spokesperson available in the day or two following the release. Reporters frequently want to speak with someone about the release and if you don’t have a spokesperson available, then the reporter may not write the story. I don’t know about you, but I’m doing more now than I ever did. With all the new tools and techniques it’s easier than ever to increase our productivity, but sometimes it’s good to stop and figure out if the tools are working for us or against us. I know I couldn’t be as effective as I am without email and tracking tools, for example, but I’ve also realized that I have to be careful how I use them. In no particular order, here are my top 5 tools to improve my productivity. Cut Back on Meetings This one won’t work for everyone, but I’m at a place in my career where I can often decide if I should be in a meeting or if another member of my team can attend. Whether the meeting is at work or for an outside activity, I want to know what the purpose of the meeting is and if it’s possible to simply discuss by email or a quick phone call. Sure, it would be great to see everyone on the committee, but most likely, we’ll also end up chatting, which can cut into valuable time. Tame Email I think we all continue to battle this one. At home, I’ve removed myself from most of the catalog emails or I have them delivered to an account I set up to receive those types of emails. I don’t respond to emails throughout the day as much as I used to. Instead I tend to check in the a.m., again mid-day and then at day’s end. Each week, I’ve been reducing the inbox by an additional five from the previous week. In the past few months, I’ve gone from more than 500 to less than 50. I no longer feel panicked that I am missing something critical because I have reviewed everything in the inbox. I still break the rule of using my inbox as a reminder, although I’m getting better with that, too, thanks to software like OneNote and EverNote. Create Digital Lists I use OneNote to keep my lists. According to Microsoft, OneNote is “a digital notebook for capturing, storing and sharing all kinds of information.” I’ve found it particularly useful for keeping multiple lists going. I have one for each vendor with whom I work. I have another notebook with tabs for each person who reports to me. This allows me to easily track information and make notes about information I’d like to share. Not only does it keep me organized but it keeps me from sending one-off messages to individuals. Prioritize On any given day, I know what I need to do. Sometimes, though, the most important item is the one I put off doing because it’s challenging or not fun to do. However, knowing that it’s my key priority and doing it first means the rest of the day should go smoothly. Before I leave at the end of each day, I write down the three things I must do the next day. When I come into the office, I know what my priorities are for the day and that’s where I stay focused (or at least try to). Exercise We all know exercise is good for us. Sometimes, I exercise to clear my head or to think things through. There is nothing like an hour-long cardio workout to clear cobwebs from the mind. Just the other week, I was on the treadmill and I figured out how I needed to handle a project. I didn’t want to stop, though, so I grabbed my cell phone and recorded a message so that I could follow up when I got off the machine. What’s your top tool to improve productivity? Are You Stretching in Your Career? During a recent global communications meeting, I used the theme “Stretch” to guide our work. Prior to this meeting, we had been working to lay the foundation. We had done a good job. At the first meeting, we didn’t even have staff in all of the regions. Now we do. We’re still continuing to build on those foundations, but it was time for us to stretch. A colleague of mine often spoke about leapfrogging, but I didn’t think we were ready for that. So on the first day I handed everyone a rubber band. Anyone who joined us throughout the week also was given a rubber band. I asked each person to look at the rubber band. Within the space of the rubber was what we were currently doing and our skills. But if we pulled on the band, just slightly, suddenly we could do more. Of course, if we stretched too far, we could lose focus and, even worse, break. That was definitely not the intent! Throughout the week we examined issues from different angles by stretching our viewpoints. We considered how we could work more optimally. At the start of each day, I challenged myself and the others to consider how they had stretched the previous day during the discussions. By week’s end, we all agreed that if each stretched just a bit, we could accomplish so much more, both individually and as a team. 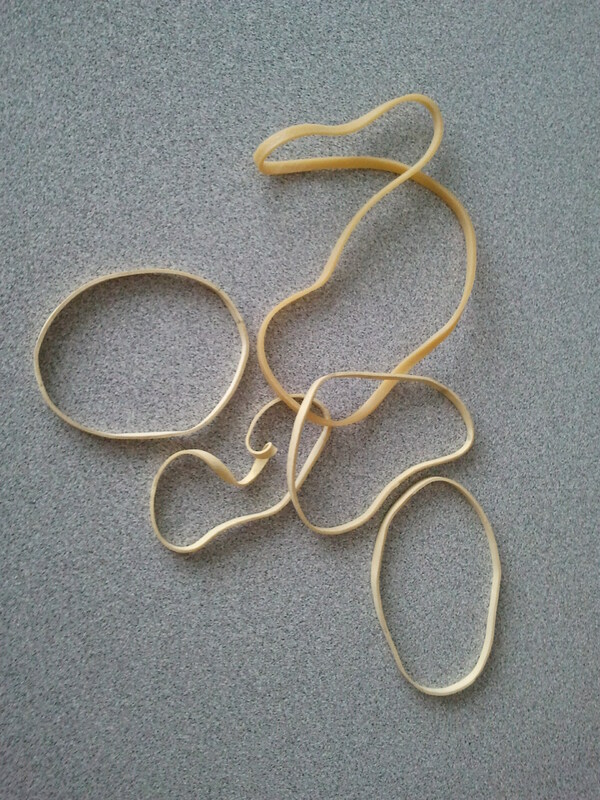 I’m keeping the rubber band on my desk as a reminder to not be complacent and to stretch. Tomorrow is the day of love. What does that have to do with a blog about communications and personal growth? A lot, actually. We all have good days and bad days at work, and on those bad days it’s good to have a reminder of what it is about the job that works for you or what attracted you to the position in the first place. If you haven’t recently, why not take a few minutes and write down what you love about your job? If you don’t have anything to say, then you know what the next step is. If you have a strong list, keep it handy for those days that can be frustrating. Whenever I look for a job, I’m looking for one where I will feel as if I’m making a difference. In one job that was reporting on my community. In another, it was helping to prevent crime. Today, it’s about impacting the lives of vulnerable children. Anytime, I consider a job where it’s only about the title or the paycheck, I know it’s not the job for me. My current job brings with it lots of responsibilities. It also allows me to travel and to learn about other cultures. It’s become one of the best parts of my job for me. Sometimes, when I’m on a 32-hour flight, I have to remind myself of what’s at the end – new food, new culture, seeing the work first-hand. At the top of my list are great colleagues. We don’t have to socialize after hours, but I want to enjoy their company at work. I want to learn from them and be inspired. I don’t want to work in a negative environment. I’m fortunate to work with great people. My final one is to work in a challenging environment, one that affords me the opportunity to learn new skills and to stretch the ones I haves. I volunteer to work on projects if I know I will learn something new. I like being exposed to other ways of thinking. I still must successfully perform my core job, but having other opportunities available makes the job more rewarding. What do you love about your job? I’d love it if you’d post a comment to this blog and share with others. You might inspire someone else. Are You Standing Still, Or Are You Growing? What have you done outside of work to make yourself better over the last two or three years? It’s a question I ask myself frequently. One thing that has helped me for the past two decades is my involvement with the National Federation of Press Women. Through that organization, I’ve developed my event planning skills, my networking skills and my leadership skills. The next conference is in Utah, and if you are a communicator, it’s a great time to get involved. If you already are a member and have not been to a conference, why not make this the year you do something to help your career? As a first-timer, you can apply for a grant to have the registration fee covered. You can also learn new skills by taking online courses. One of my favorite places to learn is Lynda.com, which allows you to participate in tutorials on thousands of software subjects for a small fee. A one-month membership is $25 or you can sign up for several months or a year and access close to 1,000 courses 24/7. I’ve found the courses helpful for improving my skills in PowerPoint and Excel and for learning the basics of new technology. Another way to improve your skills is to volunteer. One of my colleagues is a graphic artist and she volunteers those skills to help an animal rescue organization. I’ve been learning more about the world of publishing by volunteering at my local library to coordinate a writers’ series. You could also pick up a book. I try to read four to six books related to my profession each year. I’m doing better now that I participate in a book club at work that is focused on leadership. Once a quarter we read a book and discuss it. We just read The Leadership Challenge by Kouzes and Posner. The adage “If you aren’t changing, you’re standing still” is more true than ever. I ask again, what have you done outside of work to make yourself better? When I went to my first interview, I only had one question: When do I start? As I’ve continued my career, when the employer asks me if I have any questions, I take advantage and ask questions to determine if I’ll be a good fit with the organization. I don’t ask questions about benefits. For one thing, I don’t want it to seem that is all that interests me. For another reason, it’s almost always best to talk with someone in the HR department about benefits. That doesn’t mean I don’t have questions. They fall within a few key areas. Professional Growth. What is the employee review process? How is progress measured? Do you support involvement in professional organizations? Supervision. How many employees report to me? What are their backgrounds? How long have they worked for the company? Culture. Is telecommuting an option? What is the average length of tenure? What equipment is available to me and what support? Will I be expected to be available after hours? Travel. Will the job require travel? Will I have a company credit card? What are the travel policies? First Day. If possible, find out in advance your email address and phone number so you can share it with your contacts before you leave your current job. I usually ask this once I’ve accepted the offer and necessary paperwork is signed. Answers to these questions will provide a better understanding of the environment and whether you would be a good fit.